‘E’ Is For Elephants… And Education! One of my favorite aspects of "5 Elephants" is that Rob familiarizes the reader with the organizations and sanctuaries that work tirelessly to ensure that wild elephants survive into the future (including Born Free Foundation)-and that he suggests concrete steps that the reader can take to protect elephants. It's a book that introduces a problem, fosters compassion, and then actually explores solutions. Elephants present a jumbo problem today: an utterly complex web of factors that enable the continued abuse and exploitation of elephants. Gentle giants, dwindling in numbers, slaughtered in the wild and languishing in captivity. The elephant poaching crisis has become increasingly severe over the past several years. It's estimated that more than 86,000 elephants have been poached since January 2012. If the killing rate continues, certain African elephant populations could be extinct within a decade. And, despite years of effort and action, it seems that progress is made only incrementally-never big enough or fast enough to account for the immensity and immediacy of the problem. The desperate plight of elephants is so painfully apparent, but on a global scale, successful conservation efforts are hugely difficult. But, courageous advocates are stepping forward to affect real, tangible change: advancements that elephants need in order to survive. 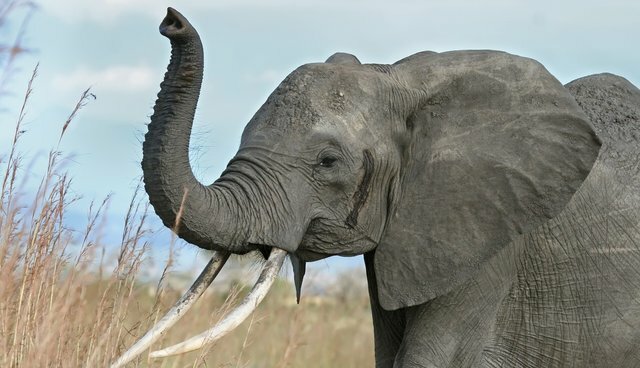 New York and New Jersey have just passed state legislation to shut down the commercial markets for elephant ivory and rhino horn-two of the most important states where ivory is otherwise pervasive in the marketplace. Bravo to Governors Christie and Cuomo for signing these important bills. The Obama Administration continues to look critically at elephant conservation as part of its overall strategy to combat wildlife trafficking. Nongovernmental organizations such as Born Free are increasingly putting resources into the field to protect elephants in the wild, where they belong. Perhaps the future for elephants is potentially bright? It all starts with education: educating children to care; educating consumers to be compassionate; educating donors to be generous; educating legislators to be visionary and courageous. ‘E' should never stand for "extinction."